This is the first book that can be considered a textbook on thin film science, complete with exercises at the end of each chapter. Ohring has contributed many highly regarded reference books to the AP list, including Reliability and Failure of Electronic Materials and the Engineering Science of Thin Films. The knowledge base is intended for science and engineering students in advanced undergraduate or first-year graduate level courses on thin films and scientists and engineers who are entering or require an overview of the field. 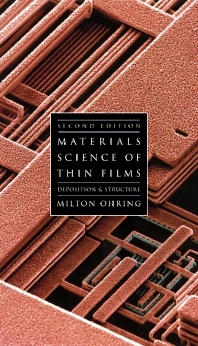 Since 1992, when the book was first published, the field of thin films has expanded tremendously, especially with regard to technological applications. The second edition will bring the book up-to-date with regard to these advances. Most chapters have been greatly updated, and several new chapters have been added. Advanced undergraduate and first-year graduate students in materials science and electrical engineering; researchers in industrial in-house courses, or short courses offered by professional societies. Dr. Milton Ohring, author of two previously acclaimed Academic Press books,The Materials Science of Thin Films (l992) and Engineering Materials Science (1995), has taught courses on reliability and failure in electronics at Bell Laboratories (AT&T and Lucent Technologies). From this perspective and the well-written tutorial style of the book, the reader will gain a deeper physical understanding of failure mechanisms in electronic materials and devices; acquire skills in the mathematical handling of reliability data; and better appreciate future technology trends and the reliability issues they raise.